When Brazilian native Kelly Oliveira signed up for the U.S. Army through a program that offered her citizenship for her service, she thought she had it made. But it took two years for the army to work through the added background checks. During that time she struggled to remain legal. 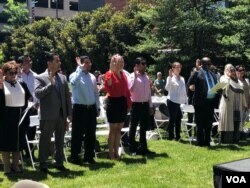 Oliveira finally made it through the process and was sworn in as a citizen last week. 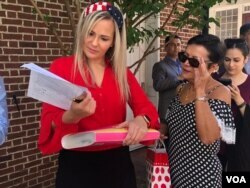 She took the oath on a day designated to honor the U.S. flag, a group of 28 people from 18 countries became American citizens at the historic house where the flag that inspired the national anthem was made. “I learned to love this country that I adopted as my own. … I’ve always [thought] of myself as an American by heart,” she said. But it took 13 years to make it official. “It's been a long journey. … Of course there were moments that I was thinking ‘Should I continue waiting?’” she said. Oliveira’s wait was due to changes in a military program called Military Accessions Vital to the National Interest program, or MAVNI reported on by VOA last December. It was launched in 2009 to bring immigrants with medical or language skills into the armed services. 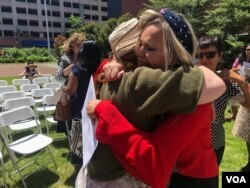 She enlisted in the Army in March 2016 under MAVNI, which promised her citizenship in exchange for service. Oliveira had tried other ways to stay legal. But nothing worked. “I went to school and I had my OPT, and I got a teaching position job as a preschool teacher,” Oliveira said. The OPT or Optional Practical Training allows international students with an F-1 visa to work in the U.S. for up to one year in a field related to their studies. She tried to get a work visa through the schools where she was employed at the time. “Unfortunately the school where I was working at; they could not [sponsor] me,” she said. That’s when she entered the MAVNI program. But on June 2016, the program was shut down, which affected Oliveira’s enlistment. The U.S. government retroactively required background checks on anyone who had enlisted in the military through the MAVNI program, including anyone who was currently serving or waiting to be shipped to basic training. For Oliveira that meant a two-year wait. She went to training drills and struggled to stay legal. Those who witnessed her journey said it was tough. “I don't think I'd be able to do it because it's, I mean, it's been a, it's been a long journey. It's been a struggle and it's, it's been like a nightmare,” Lauren Schroeder, a D.C. native who has been friends with Oliveira for many years, told VOA. “I mean the down was the fact that it took so long. And I guess the up is that she was able to join the military and get a citizenship that way. So finally, it happened,” Schroeder said. Margaret Stock, a retired Army lieutenant colonel who created the MAVNI program, told VOA she is not surprised by Oliveira’s successful story. “That’s what’s supposed to happen. They’re eligible for citizenship and they’re supposed to be able to get it quickly,” Stock said. But the retired Army lieutenant colonel said, even though there are stories like Oliveira's, lots of recruits are still falling out of status due to the additional checks. “So people are timing out and they can’t ship out to basic training until the [U.S. government] completes all these background checks,” she said. In a previous interview with VOA, Stock said everyone who wants to serve in the military has to go through background checks but the government was already doing a lot more background checking on the MAVNIs. “They are the most checked group of people that entered the U.S. military," Stock said adding this is an investigation normally done on someone getting top-secret clearance with the U.S. government. On Flag Day, Oliveira signed the papers. She checked in with immigration officials. Then the ceremony started. “Sky's the limit for me now it's just the beginning of my new journey. Now I'm going to basic training in a couple of months, and I'm very excited about that,” Oliveira said.